I decided to make this fun listacle to list out 25 small changes you can make that really do add up. 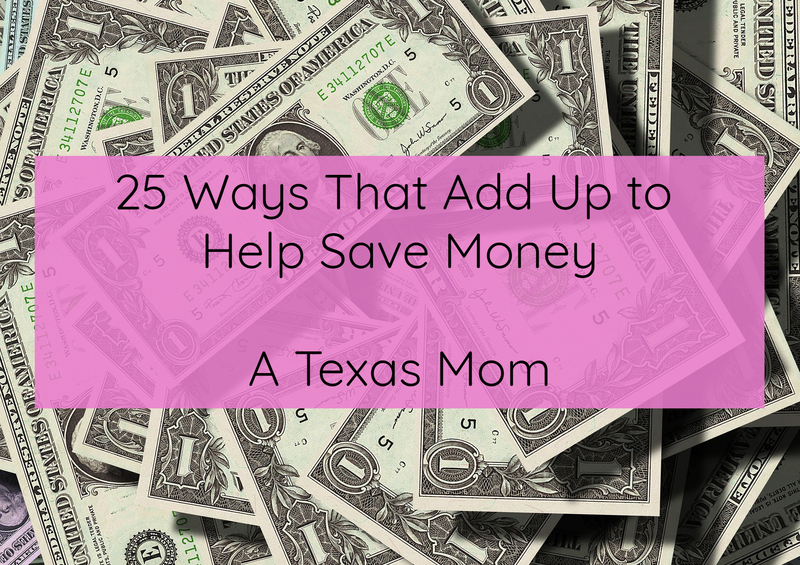 When we decide to save money, there are many ways you can cut back your spending. Regardless how small the cut back, every little bit you can save helps. Set reminders or set up autopay to pay bills on time. Late fees can be expensive so avoid something as simple as setting a reminder or autopay will help. Cut down your cable package or cut it off completely. You can read how I saved money by switching to the Amazon Firestick. Go over cell phone/wi-fi bills to see if any cuts can be made or any changes. You can read how I went to pre-paid service to save money. Use space heaters and fans to cut down on AC/Heating Bills. Use coupons when possible and research before paying retail for anything. Plan and research ALL big purchases. Swap name brand for off brand at the grocery store. Make menus and cook at home. Limit eating out. Use your local grocery store’s curbside pickup service. Order your groceries online which will help you stick to your list. You can read how I use Kroger Clicklist to stay on track here. Shop around for car insurance or talk to your current provider about any discounts you may qualify for. Clean the house, attic and garage. Sell unwanted items locally or online. Facebook marketplace is quite popular. Don’t buy new. Shop local thrift shops for clothes, furniture, and houseware. You’ll be surprised what treasures you can find at really great prices. Plan for a night in with friends and family rather than heading out to a restaurant or event center. Turn off the lights and unplug small appliances you aren’t using. Somewhere throughout the years, I turned into my parents. My kids ALWAYS leave the lights on, and I’m always turning them off. Drink water. Soda is expensive. Start a garden to save money on your favorite herbs and veggies. Purchase a used vehicle rather than brand new. Check out an online car shopping experience like Carvana. Fees are lower because you cut out the middle man. That’s where I bought my vehicle. And I’m driving it until the wheels fall off. Take advantage of money saving cell phone apps. You can read about ones I use here. Make homemade gifts instead of purchasing. Pinterest has tons of hand made gift ideas. Add money to your savings account automatically. Set up an automatic transfer to move 10% of each of your paychecks into your savings account. Save it before you see it and spend it. Save loose change and take it to the bank at the end of the year to put into your savings account. Let me know in the comments what changes you’ve implemented that have helped save you money that might not be on this list.